Life also moves quickly and we need to create daily vacations when we can get away from the loud noises of our world. We need days dedicated to exhaling our busy-ness and inhaling rest. That’s why I simply do not like how some retailers are opening up on Thanksgiving to get a headstart on the Christmas shopping season. Thanksgiving was one of the few times in American life when everything stopped for a single day and people were able to pause. With certain exceptions, they were able to enjoy time away from the grind and were reminded of the source of our blessings (small or great). I wrote a little bit last week about taking time away on a retreat day from the world, and then how to implement it into a routine. I would urge you here to consider developing a cathedral of time, a sacred space where you can leave the world filled with problems. While cities might be bustling with activity, within the safe confines of a Roman Catholic cathedral, it is calm and restorative. Candles, hushed whispers of prayers, and soaring heights center the worshipper toward the God who fills the cosmos. Similarly, I want to recommend setting up spaces amid a full life that can be dedicated to passions and hobbies. When life is relentless, I need to find a place to refill my weary soul before I implode. For me, I recharge when I make time to write, read, paint watercolors, or engage in physical activities. Others might find peace through piano playing, model building, scrapbooking, shooting, or baking. Whatever might bring you joy, try to engage those things. If you do not have at least one, consider trying new things to discover new passions. Go to a symphony, take a pottery class at junior college, or join a chess club. 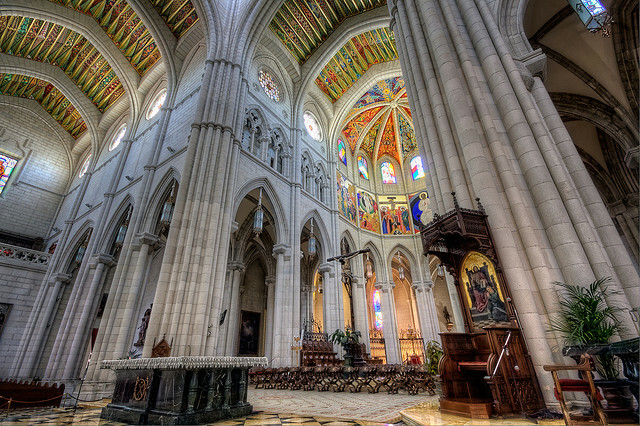 The important thing is to find passions and pursue them, intentionally setting up a cathedral in your full life. One more thing, please do not consider TV viewing a hobby or passion. According to most studies (and also personal experience) watching more then 1-2 hours of TV decreases happiness levels. What are you hobbies or passions? I too am really disappointed in all the businesses opening up on Thanksgiving. I went to Target last year on Thanksgiving night with my husband and sister-in-law and I have no intention of doing that ever again. I’ve heard a lot of people online make the argument that law enforcement and medical workers have been on duty for Thanksgiving and other holidays for years and years, and no one bats an eye. The difference, I believe, is in what we as a society view as necessary. There is always a need for first responders, because crisis is no respecter of holidays. However, you would think that after yearly news stories covering people fighting with each other (and even killing!) to get a good deal, we would figure out that it just isn’t worth it anymore. Well said! Ultimately we can change the trajectory of merchants through our debit cards. If people who value family, mom, and apple pie can wait until Friday, then perhaps the retailers will get a message for next year. Funny enough, Nordstroms is going to keep the stores closed until Friday. Good for them!